I recently returned from an epic adventure which took me across the world to Namibia. It was my first, but hopefully not my last visit to Africa. I spent almost three weeks there, but I really feel as if I only had a tiny sampling of what that immense and diverse continent has to offer. One of the coolest things, of course, was seeing the wildlife up close and personal. For example, my first morning there, I stumbled out of my hut–camera in hand, of course–with the intention of walking to the dining room of the lodge for a cup of coffee. Said mission was quickly forgotten, however, when I noticed several giraffes feeding in the area. The giraffes were far more interested in the leaves on the trees than the photographer on the ground, which was good for all of us. I was able to approach them close enough to get some nice shots without disturbing their breakfast. 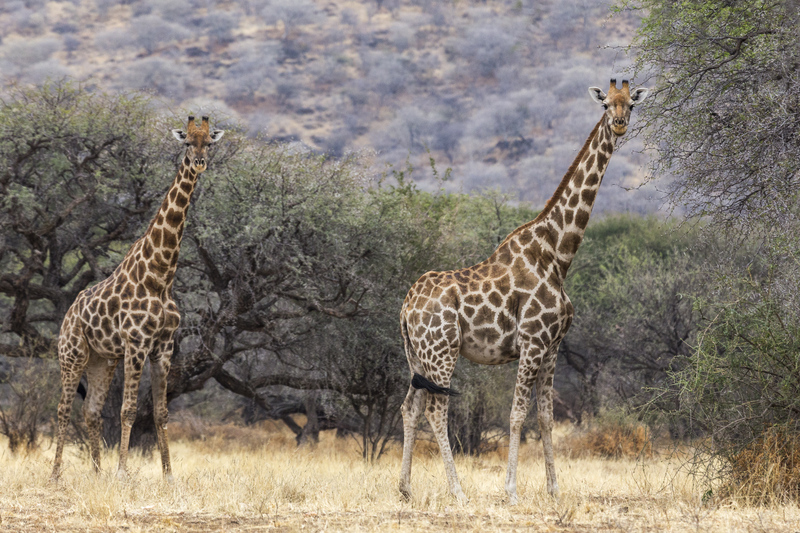 Giraffes, as everyone knows, are very tall, but they are also incredibly graceful for their size. I loved watching them twist their necks around as they searched out the most succulent leaves to nibble on. Photographing giraffes eating breakfast before I had my own was a fine way to begin the day! Dang! I’ve always wanted to go to Namibia. Can’t wait to see more of your photos…this one is a winner right out of the gate! It took me over 20 years to finally cross Namibia off the Bucket List, although I would gladly go back again. So much more to see and do. I highly recommend it! I see you like shooting sand dunes, and Namibia has the world’s tallest. You’d be the proverbial kid in a candy store there! Wow spectacular ! Amazing! Fantastic. Looking forward to hearing more about your journey! Gee, thanks for all the superlatives!